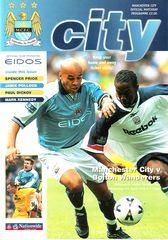 JOE ROYLE, the Manchester City manager, was more than happy to meet Bolton Wanderers just four days after their exertions in the FA Cup semi-final, and the reasons for his contentment were justified at Maine Road last night. In suffering crucial lapses of concentration, Bolton’s chances of reaching the Nationwide League first-division play-offs became slimmer still, while City , in regaining second place, enhanced their claims for automatic promotion. Forgiveness and hope had characterised the early stages for Bolton. Dean Holdsworth, pilloried for his profligacy against Aston Villa at Wembley last Sunday, received a warm welcome from the visiting fans and responded by forcing a save from Nicky Weaver from a long-range free kick. It was soon apparent, however, that the only real threat that Bolton posed was to themselves, in defence. 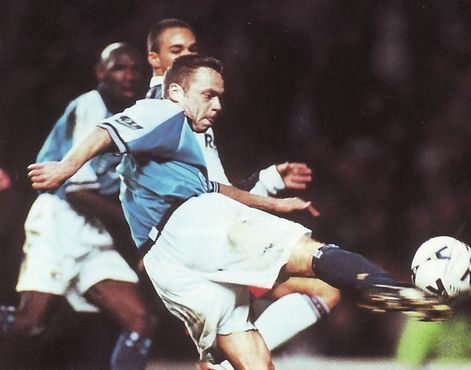 Although they will claim that an offside decision should have been given against Paul Dickov early in the move, there was no excuse for the lack of marking as Kevin Horlock latched onto Dickov’s pass to put City ahead after 18 minutes.